It’s often called woven wicker and resin weave, as well as rattan, and you’ll find sets and combinations to suit families, couples, and large parties. In focus here is one of the larger sets called the Kingston Deluxe Corner Dining Sofa Set, a stylish collection that comes with a table and several different seating options. It also comes complete with cushions, so you’ll be ready to go as soon as it arrives. The mix of seating options – this set seats up to 10 people, but is very flexible, and you can easily get out or move the 3 stools and use them as seats or foot rests. There’s also a rattan corner sofa unit included along with a dining table, which offers plenty of space for meals, craft activities, or just relaxing on a sunny day. The details – this deluxe dining set can be configured to suit, so you can split it for different parts of the garden. It also innovating by featuring a reclining seat, so you can use one part of the sofa as a sun lounger, something that is sure to make this dining set stand out in the years to come. Cleaning – This is easy, you just need to use a jet wash system, and it really is easy clean. Durability – The feet are finished with an aluminium cap, which will prevent the rattan fibres unravelling, and nylon will stop the feet marking or chipping. The overall effect is a set of furniture that will last for up to 20 years outside. If you live in the UK, this furniture sent will be sent to you free, and mail order packaged to prevent any issues in transit. When it arrives you’ll have peace of mind with a 12 year warranty. Some colourful cushions, bug repelling candles, a drinks cooler and you will have created the ideal garden space in no time. 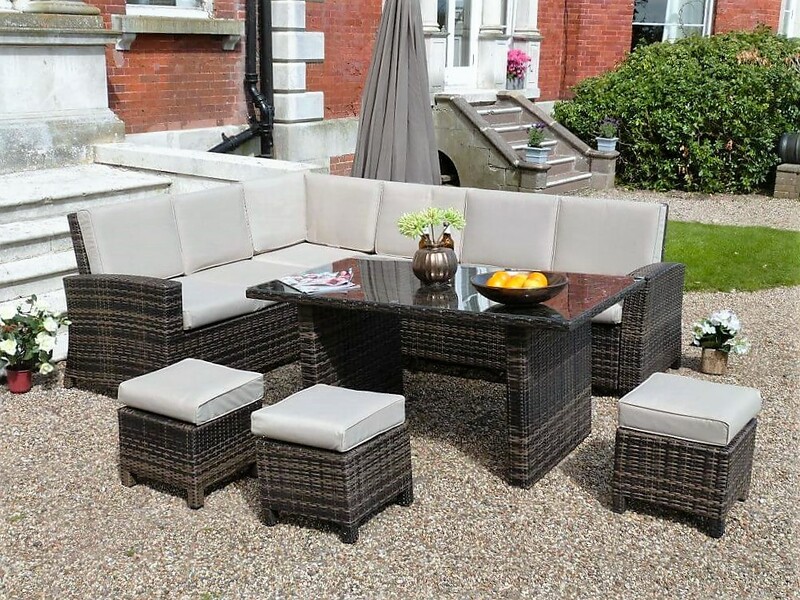 Any kind of rattan garden furniture can vary a lot in terms of weight, whether it is self-assembly or not, the type of frame, and the grade of materials used – so it’s always worth reading the full spec, and comparing similar items as you browse. The Kingston Deluxe offers a host of common benefits that you’d look for in rattan garden furniture, and some details and features that promise just that little bit more, which, when you are ordering a product that will have versatile use, is always a bonus. Why not do some garden furniture comparisons and see for yourself? Mick Batt runs Home Improvements in Essex, and helps homeowners to not only improve the function and aesthetics of their homes, but also improve their carbon footprint to save money and help the environment. Rattan Garden Furniture is known for its durability, and that’s all down to the aluminium frame. Any kind of rattan garden furniture can vary a lot in terms of weight, whether it is self-assembly or not. This entry was posted in Yard and Garden and tagged Beautiful Garden Furniture, Benefits of Rattan Furniture, Buying Furniture, Buying Rattan, Garden Furniture, Garden Furniture Review, Garden Trend, Kingston Rattan Garden Furniture, Outdoor Furniture, Rattan Corner Sofa, Rattan Furniture, Rattan Furniture Sets, Rattan Garden Furniture, Rattan Garden Furniture Review, Rattan Outdoor Furniture, Rattan Weave, Resin Weave, shopping for furniture, summer garden furniture, Woven Wicker. Bookmark the permalink.